The roaring 1920’s was the inspiration for this glamorous waist length Primrose Juliet cap veil. Its Intricately hand beaded headpiece glistens with glass beads, sequins and crystals, framing the face beautifully, a truly striking look. The diaphanous veil has 2 layers of luxurious tulle in differing lengths that create a beautiful draping effect; the top veil can also be worn over the face. The veil in the photographs is a waist length veil, 43” & 33”. This veil can also be purchased in floor length, chapel length or any custom made length, please contact for further details. Please note: This veil is made to order and has a 6-week delivery time from purchase. 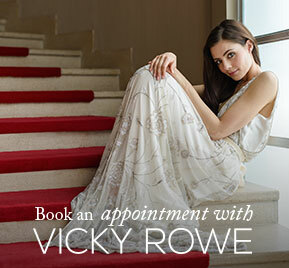 For more information or to book a consultation with Vicky Rowe, feel free to get in touch.